Today, we will still focus on making digital entertainment better on Sony Walkman. A few ways ago, we have discussed the best tips on how to transfer Spotify playlists to Walkman MP3 player and how to play Audible audiobooks on Sony Walkman. In this article, we will share the successful experience of playing iTunes music on Sony Walkman. It could be more convenient and portable to listen to Apple Music tracks on MP3 player as it is lighter and smaller than mobile phones. If you are owning a Sony Walkman MP3 device and subscribing Apple Music plan, let’s get started to transfer Apple Music to Sony Walkman for offline playback on the go. Part 1. Is the Sony Walkman Compatible with iTunes? Have you tried to transfer iTunes music to Sony Walkman? If the answer is yes, you might have already known that Sony Walkman can’t recognize Apple Music files directly. As the hottest streaming music service, Apple Music offers almost all your music favorites in one place and allows you to stream songs and playlists to your iPhone, iPod Touch, iPad, etc. with its Music app. Unfortunately, there is no built-in Apple Music app on Sony Walkman player. You might think of syncing downloaded Apple Music to Sony Walkman from your computer via USB port. Please don’t miss the important point that Apple Music are encoded in M4P audio format but Sony Walkman only supports the following audio file formats, including MP3, WMA, AAC, etc. What’s more, Apple Music are encrypted by FairPlay DRM technology, which prevent users from playing Apple Music M4P files on Sony Walkman player and any other unauthorized Apple devices. After we discussed the reasons why you can’t play Apple Music on Sony Walkman, let’s focus on how to add music to Sony Walkman from Apple Music. To make iTunes music and playlists available for Walkman MP3 player, the best solution is to use a professional third-party Apple Music converter to remove DRM from Apple Music tracks and convert unprotected M4P to Sony Walkman compatible audio files, like MP3, AAC and so on. 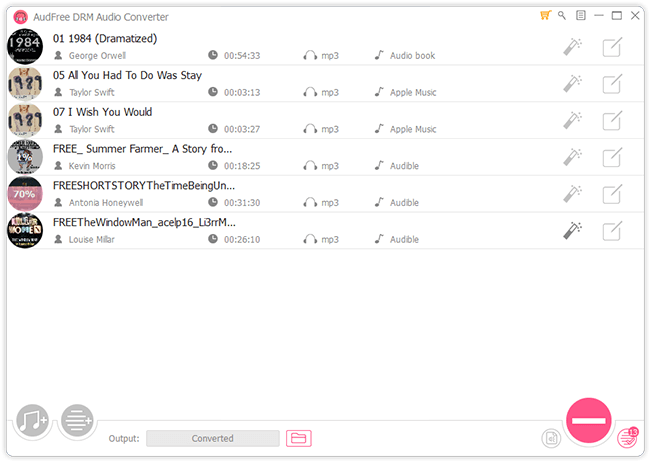 Here, we can meet AudFree DRM Audio Converter, which is well-designed to convert Apple Music, iTunes M4P music and M4A/M4B audiobooks to FLAC, WAV, AAC, MP3, M4A and M4B while getting rid of DRM protection. It runs at 30X faster speed and keeps 100% original iTunes audio quality, including all ID3 tags preserved. With the assistance of this smart Apple Music Converter, everyone can add Apple Music tracks to Sony Walkman, just like playing common MP3 audio files on Sony MP3 player. Remove DRM from Apple Music playlists, tracks, etc. 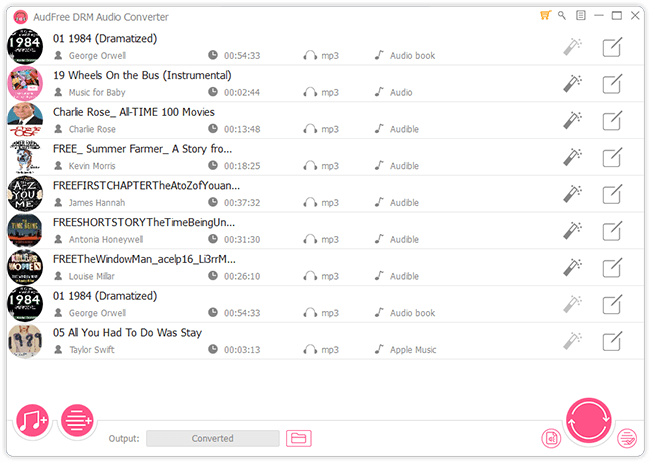 Convert Apple Music M4P to MP3, WAV, FLAC, AAC, etc. 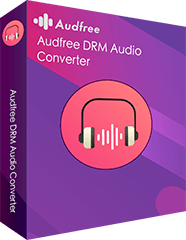 Just click the above download button to download and install AudFree DRM Audio Converter on your Mac or Windows computer. And then you can refer to the following detailed tutorial to play iTunes Apple Music on Sony Walkman. Note: The trial version has the limitation of conversion time, you’d better to purchase the full version to break this lock. When launch AudFree DRM Audio Converter, please click the ‘Preferences’ to choose ‘Register’ icon and type your register info to activate this software. And then please click the first ‘+’ button to add downloaded Apple Music streams from iTunes library to AudFreee. Alternatively, you can drag and drop offline Apple Music files to the conversion window. In the main interface, there is an ‘audio’ button to let you customize output audio parameters. Just simply touch this icon and then a setting window will pop up, in which you can define output format as MP3, FLAC, AAC, M4A or other Walkman supported audio formats. Also, you can change sample rate, bit rate, audio channel as well as codec to enhance audio quality. 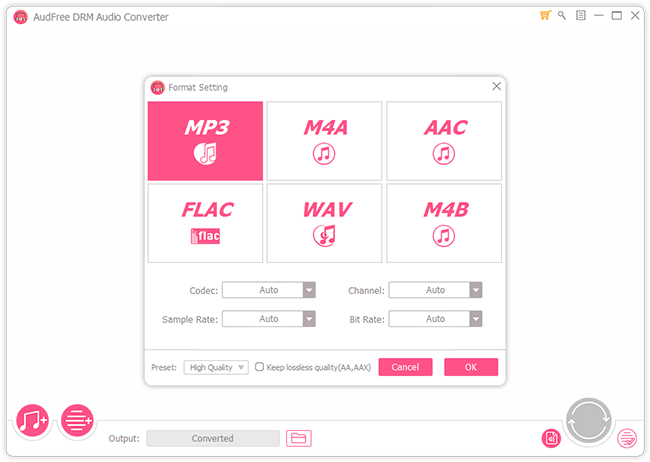 Just simply press the ‘Convert’ button at the bottom-right corner of the main interface, AudFree DRM Audio Converter will automatically convert added Apple Music DRM M4P files to the target audio files you set before that are fully compatible with Sony Walkman. You can click the ‘history’ icon to preview all converted Apple Music tracks on your computer. Once you have located unprotected Apple Music tracks, you can connect your Sony Walkman MP3 player to your computer via USB port. Find the Walkman folder on your computer, double-click the Walkman device icon, and then you can browse and select the Apple Music folder to sync Apple Music to Sony Walkman for offline listening. 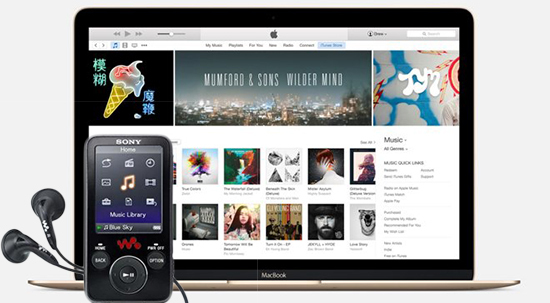 Apart from transferring Apple Music to Sony Walkman, you can also freely play Apple Music on other popular MP3 players, like SanDisk MP3 player, iPod Nano and Shuffle, etc.